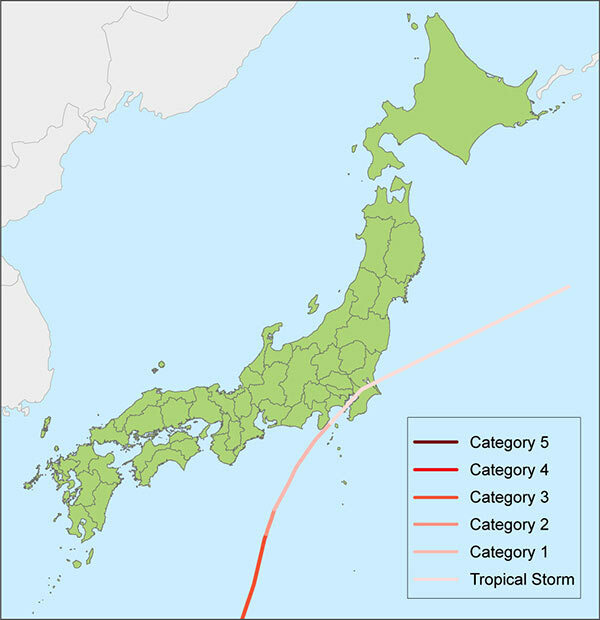 On September 15, 1947, Typhoon Kathleen made landfall in the Kanagawa Prefecture, just south of Tokyo. One-minute sustained winds at landfall were estimated at 120 km/h—just barely equivalent to a Category 1 hurricane. In Shizuoka Prefecture, south of Kanagawa, one-minute sustained winds exceeding 88 km/h tropical storm strength were reported. Having weakened by the time of landfall, wind damage was restricted to towns along the immediate coast. More extensive, however, was the damage from precipitation-induced flooding from Typhoon Kathleen, which dropped between 300 and 800 mm of rain in the Tone River basin in just two days from September 13 to 15—yielding the highest flood discharge ever observed. North and east of Tokyo, several dikes were breached and embankments suffered failures, resulting in severe flooding along the Tone River, particularly in Kurihashi. More than 303,000 buildings were inundated, and 1,077 people were killed. This entry was posted in Uncategorized and tagged 15 September, 1947 by Admin2. Bookmark the permalink.